You’re probably seen tent caterpillar nests in trees in your yard, neighborhood, or at the side of roads, in wild cherry trees or crab-apple trees. They spin web-like nests and propagate. Each nest holds hundreds of caterpillars. During the day they come out and munch on the leaves of the tree or (we’ve discovered) sun themselves on cemetery monuments. 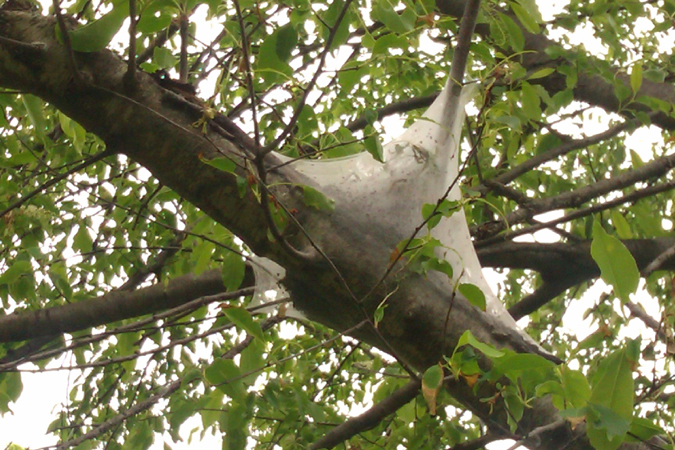 Tent caterpillars are bad news for fruit orchards, since they prefer to build their nests in fruit trees. Since we have many fruit trees on the property – cherries, plums, peaches, apricots, pears, and quite a few apples – we had to climb the fruit trees or stand on ladders with longs poles, to pull down the tent caterpillar nests. After they were pulled down, they were deposited in a bucket. 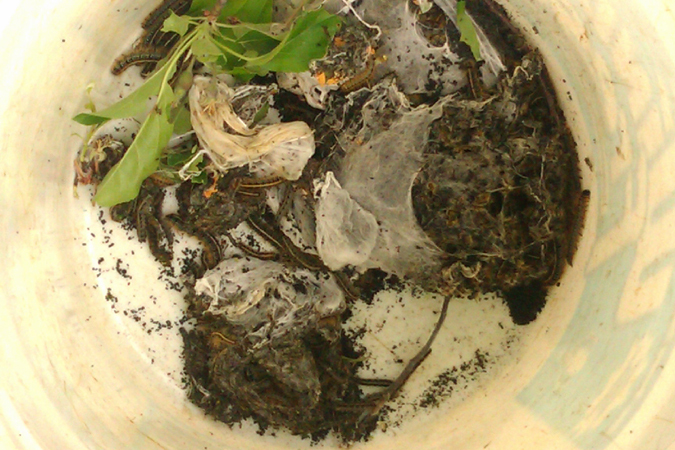 Most of the tent caterpillars survived the ordeal. We decided not to kill them. Instead they were removed to another location where they would be no threat to our fruit trees. After they become moths, they are welcome to return.